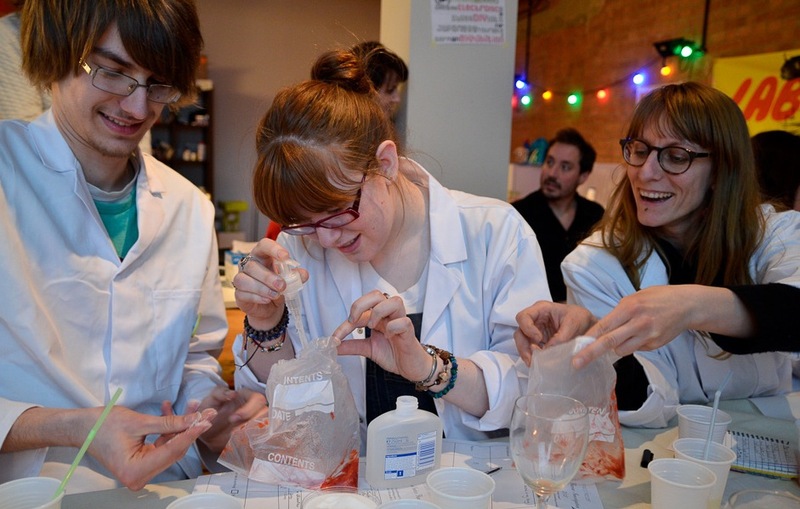 MadLab and Arts Catalyst's LabEasy:DIY Biology for the Bio-Curious  has won the European KiiCS Award on arts and science for innovation. LabEasy is a new concept of lab designed to learn about life sciences “by doing”. It was developed as part of the art and science activities run by Arts Catalyst (UK). LabEasy focused on the emerging field of "DIYBio" and transformed Arts Catalyst's warehouse-style events space into a DIY lab, offering participants low-fi alternatives to standard lab protocols through a series of open labs. The workshops were attended by artists, designers, fellow DIY biologists and academics – creating a cross-disciplinary setting and catalyst for future ideas for artworks, studies. The winners (Asa Callow and Rachael Turner from MadLab) will be offered free business mentoring support by the St John’s Innovation Centre in Cambridge. In the KiiCS Young Adult section, the award went to “Slave for Love” – a device detecting whether you are in love or not by measuring the level of oxytocin in your body, developed as part of art and science activities run by Kapelica Gallery (Slovenia). The Young Adult (Petja Skomina) will receive an iPad Mini. The winning ideas resulted from the art and science incubation processes experimented over the lifetime of the EU-supported project KiiCS. The shortlist can be seen here . The ideas were assessed by an International Jury composed of five arts and science experts (from Ars Electronica, Royal Netherlands Academy of Arts and Sciences, ARTE France) on the basis of originality and innovation criteria. Winners were unveiled on Friday 26 September, in Amsterdam, the Netherlands, at the KiiCS Award Ceremony taking place as part of the Discovery Festival. The International Jury also gave a Special Mention in the Adults Section to artists Laura Cinti and Howard Boland's "Living Mirror", an interactive bio art installation that produces real-time images or patterns using living magnetic bacteria, developed as part of Waag Society's art and science incubation activities (Netherlands). A similar mention was awarded in the Young Adults Section to “Ergonomics, study of the back and design of a system to detect bad positions” by the Youth Advisory Board, a body gathering young people in charge of providing inputs to and promoting KiiCS across Europe. This idea was developed at Domus (Spain). KiiCs  (Knowledge Incubation in Innovation and Creation for Science) is a 3-year European Commission-funded project.